Type 2 Diabetes is the most common type of diabetes. Dr. Gopika Gangupantula offers comprehensive services for patients seeking necessary management of this chronic condition. 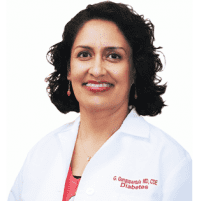 At Valley Diabetes & Obesity, Dr. Gangupantula provides family support and nutrition counseling or management, all ensuring customized treatment. Each patient’s plan for management differs based on lifestyle, degree of illness, mindset, and health goals. Contact her practice, located in Modesto, California to schedule a consultation and start improving your health today. Type 2 Diabetes is a strain of diabetes that also affects the way your body handles the glucose in your blood. The majority of people with diabetes have type 2; their bodies do produce insulin, but their cells don’t use it as it’s intended. Dr. Gangupantula can best assess your factors for developing diabetes. What are symptoms of Type 2 Diabetes? Contact Dr. Gangupantula as soon as you suspect you may be affected by Type 2 diabetes. How can I maintain my health with Type 2 Diabetes? As a Diabetes and Obesity Specialist, Dr. Gangupantula can help you maintain your health. Visit her practice to receive a personalized health plan.